Warning: An Instrument Used For A Fraud Recently Found in an ATM! One of the most controversial issues that the country is facing now is the millions of dollars stolen from the Bangladesh Central Bank. According to recent reports, 12 Filipinos are involved in the alleged hacking, fraud and theft. Even before this issue was exposed, a lot of citizens experienced losing their hard-earned money without their knowledge. How can this be possible? 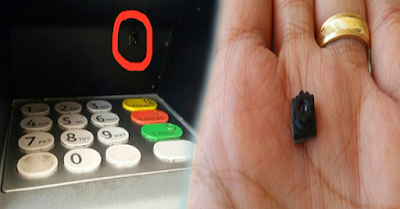 In one of the posts of a netizen, he gave a warning to everyone to rigidly check the automated teller machine before transacting. 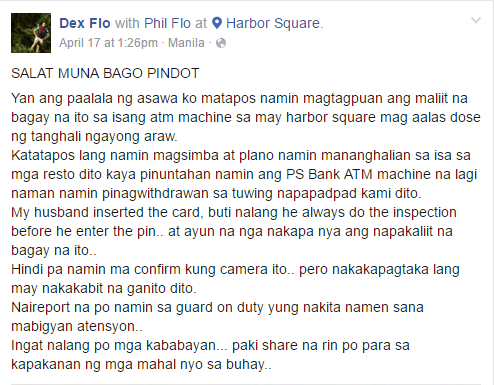 He posted a picture of a very small instrument (believed to be a camera), which he allegedly found at an ATM at Harbor Square. According to Dex Flo, her better half discovered the small camera-like tool while using the machine. Apparently, they escalated the issue to one of the guards and reported the issue.